Over the last few months we’ve seen a spike in patients who’ve come to see us because “my blood count is too high.” The patients are puzzled. Why am I seeing sleep specialists when “I have too many red blood cells?” They’re seeing us because they have very smart, deeply caring primary care physicians. So let’s look at the possible ties between an elevated hematocrit (the measurement of red blood cell count relative to blood volume) and sleep disorders. Our patient had been diagnosed with Obstructive Sleep Apnea several years prior, and was using a CPAP, but reported that he had excessive daytime sleepiness and that he did not feel rested despite the CPAP treatment. Our patient looked like he was in the ranks of the subjects in a study published in Sleep Breath in 2006,* which concluded that sleep apnea alone is a risk factor for an increased hematocrit. 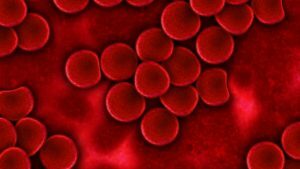 Why are “too many red blood cells”—a condition called erythrocytosis—a bad thing? Because it usually means that there is a shortage of oxygen in the system and the body is creating more red blood cells to carry more oxygen to make up for the shortage. An elevated hematocrit is a risk marker for some very serious illnesses: heart disease, kidney disease and stroke. And less threatening but really unpleasant symptoms include pain, weakness, fatigue, headache, blurred vision and mental fuzziness. That Sleep Breath study showed that as the average oxygen (O2) saturation dropped, hematocrit rose. The low-oxygen—hypoxic—environment created by sleep apnea is one possible mechanism for dropping O2 and elevating hematocrit. And as oxygen falls, your body has two main ways to compensate: (1) take in more air—not usually possible if you have sleep apnea; (2) make more red blood cells to carry more oxygen and/or concentrate the red blood cells by decreasing the other elements that make up your blood. Over time, the body becomes more and more accustomed to low oxygen levels and the hematocrit stays elevated. Enter those very smart primary care physicians! In a patient with a consistently elevated hematocrit and other risk factors such as large neck circumference, high blood pressure, overweight and symptoms such as snoring and excessive daytime fatigue, it’s time for a sleep specialist to make an evaluation. So what was going on with our patient who was using CPAP, but was excessively tired and unrested and had persistently elevated hematocrit? We put him on a program of optimized settings for his CPAP and a new mask better suited to him, combined with recommendations to be a “side-sleeper” not a back sleeper, to reach ideal body weight and to avoid alcohol around bedtime. Results? We tested his blood levels again within 30 days of modifying his treatment, and his hematocrit tested normal, as did his hemoglobin. His red blood cells were just right! Keep in mind, an elevated hematocrit does not necessarily mean you have sleep apnea. Nevertheless, over the years we have diagnosed and treated patients for OSA who have suffered at length with the effects of hypoxia because their health care providers did not consider a sleep disorder as the secondary source of their elevated hematocrit. So cheers for those perceptive and caring primary care physicians who get their patients with “too many red blood cells” evaluated for OSA! Captain John Koch, MD, was recently a 4th-year medical student at Saint Louis University School of Medicine who engaged in a sleep and pulmonary specialty rotation with Dr. Ojile. Dr. Koch contributed greatly to the research and development of this review of elevated hematocrit and obstructive sleep apnea. We recognize his participation with gratitude.